How do you even bein to recommend a book such as this? I recently read an article from a fellow bookseller out of Nashville in which she writes of Bluets: "(surgeon's warning: take with a glass of whiskey late at night, read in one sitting)." I agree. 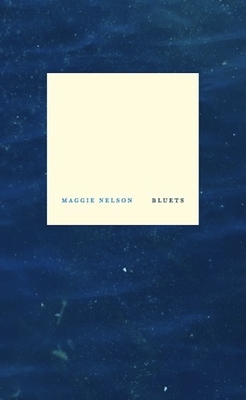 She writes of Bluets that it demands a kind of shared sadness and beauty. I guess all I can add to that would be that this is the most beautiful and most necessary of any book I've ever read. It has stayed with me and stays with me and will stay with me. I thank Maggie Nelson every day for this little masterpiece. "To wish to forget how much you loved something--and then, to actually forget--can feel, at times, like the slaughter of a beautiful bird who chose, by nothing short of grace, to make a habitat of your heart." Maggie Nelson is the author of several books of poetry and nonfiction, including Something Bright, Then Holes (Soft Skull Press, 2007) and Women, the New York School, and Other True Abstractions (University of Iowa Press, 2007). She has taught writing and literature at The New School, Wesleyan University, and Pratt Institute of Art, though currently teaches at CalArts.